The Obama administration gave green signal to a chemical weapons attack plan in Syria that could be blamed on President Bashar al Assad‘s regime and in turn, spur international military action in the devastated country, leaked documents have shown. If there wasn’t enough to confirm that the corporate media was in lockstep with the authorities, the above report is based on a story that appeared the day before in the UK’s Daily Mail. 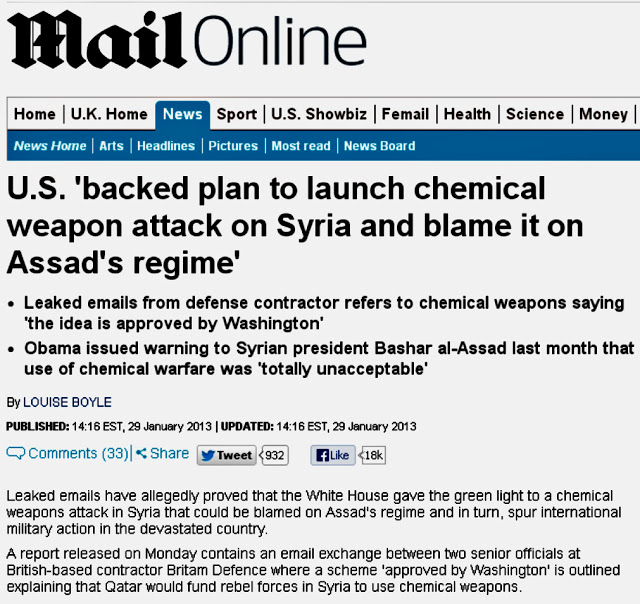 A more detailed and extensive report, it quoted emails between two senior officials at Britam Defence where a scheme ‘approved by Washington’ is outlined explaining how Qatar would fund rebel forces in Syria to use chemical weapons. In fact the Daily Mail’s report was based on a story by Paul Joseph Watson that first appeared on Infowars.com. The Daily Mail report has since been scrubbed from the Mail’s server. Fortunately however, the appropriately named Black Vault website copied the report before it disappeared down the memory hole. It is now all the more pertinent given the recent U.S. strike on Syria. The U.S. president may have changed but Trump is still following his predecessors’s agenda.